This healing food is a member of the allium family. Its cousins are garlic, leeks and chives. Our eyes know it as that which induces watering. 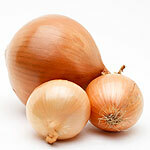 The simple onion is loaded with flavour and nutrients. A new study has put a remarkable twist on the onion, suggesting that we think twice before disposing of the onion’s skin. Scientists say onion skin could be used as a food cure. The brown skin and external layers are rich in fibre and flavonoids while the discarded bulbs contain sulphurous compounds and fructans. All are beneficial to human health. Onion waste is on the rise, to the point where it is becoming an environmental concern in many countries. That may have spurred the recent study, which found that onion waste is a natural source of ingredients with high functional value. In the lab, researchers carried out experiments to uncover the substances and possible uses of each part of the onion. According to the study, the brown skin could be used as a functional ingredient high in dietary fibre (principally the non-soluble type) and phenolic compounds, such as quercetin and other flavonoids (plant metabolites with medicinal properties). The two outer fleshy layers of the onion also contain fibre and flavonoids. – Fibre reduces the risk of heart disease, gastrointestinal complaints, colon cancer, type-2 diabetes and obesity. – Phenolic compounds help prevent coronary disease, have anti-carcinogenic properties and in high levels inside onion waste, become strong antioxidants. – Fructans are prebiotics, which have beneficial health effects as they selectively stimulate the growth and activity of healthy bacteria in the colon. – Sulphurous compounds reduce the accumulation of platelets, improving blood flow and your heart’s health in general. They may also act as antioxidants and anti-inflammatories. The researchers say their results show that it would be useful to separate the different parts of onions produced during the industrial process. And on a consumer level, I suppose the goal is to figure out how to prepare and cook onion skin and onion bulbs so that you can soak up their nutrition.